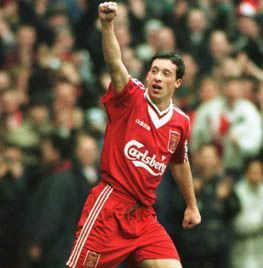 Christened 'God' by the Kop, Robbie Fowler is one of the most revered players in Anfield history. The Toxteth Terror is also one of the most natural goalscorers ever to wear the famous red shirt. A boyhood Evertonian, he switched allegiances aged 11 after being persuaded by scout Jim Aspinall to join Liverpool's Centre of Excellence. Even then, his vast potential was there for all to see as he tore apart just about every junior scoring record. Fowler progressed through the ranks as expected and in April 1992 was rewarded with a professional contract. Within nine months he appeared on a senior teamsheet for the first time when named as a sub in a third round FA Cup replay at home to Bolton. The lower league Trotters prevailed 2-0 on the night, proof if it was needed that Liverpool were crying out for a player like Fowler. Somehow boss Graeme Souness resisted the temptation to blood him until two months into the following season – but it was worth the wait. The starlet netted on his debut in a League Cup match against Fulham before amazing spectators and pundits alike by scoring all five in the return leg at Anfield. An instinctive goal-poacher, Fowler ended the campaign as Liverpool's top scorer with 18. Aided by a fastest-ever Premiership hat-trick against Arsenal, his first full season transformed him from promising youngster to fully-fledged superstar. Breaching the 30-goal mark for the first time, the 1994-95 campaign ended with the Scouser clutching a Coca-Cola Cup winner's medal and the PFA Young Player of the Year award. What Fowler lacked in pace and height, he made up for with an uncanny ability to sniff out goals. Close-range tap-ins or 25-yard super strikes, the 'Growler' was wonderfully adept at both. The 1995-96 season saw him plunder 30-plus goals once more and retain his Young Player of the Year award. He outshone Eric Cantona on his over-hyped 'return', much to the chagrin of Sky TV no doubt, and fired the Reds to an FA Cup final appearance at Wembley. Four goals at home to Middlesbrough in December 1996 brought his tally to 100 in less time than striking mentor Ian Rush, while another 30-goal haul the following season took Liverpool the closest they came to a 19th League Championship during this era. The classic 'local boy made good', Fowler's popularity among the fans was at a scale not seen since Kenny Dalglish in his pomp. To them, he could do wrong, even if his infamous Spice Boy image brought unwanted off-field attention. A lovable rogue, Fowler never forgot where he came from and in 1997 famously went public with his support for the sacked Merseyside dockers during a UEFA Cup tie against Brann Bergen. The year also brought a UEFA Fair Play Award for admitting he had not been fouled by Arsenal keeper David Seaman after a penalty had been awarded during a league match at Highbury. Two serious injuries then forced him to endure a lengthy and frustrating spell on the sidelines, which coincided with the emergence of Michael Owen. But, although Fowler temporarily lost his 'golden boy' status, Owen could never boast the same kind of rapport with the Liverpool crowd. With Gerard Houllier in sole charge, the marksman found himself a victim of a controversial rotation policy, though his popularity in the squad at least prompted the gaffer to hand him the captain's armband. In February 2001, Fowler scored a spectacular goal during Liverpool's Millennium Stadium debut before holding aloft his first trophy as skipper - the Worthington Cup. It proved to be the first leg of an unprecedented treble, with the number nine also featuring in the FA and UEFA Cup finals (and netting in the latter). Despite these goalscoring heroics, speculation that Houllier wanted rid refused to disappear and in November 2001 the unthinkable happened: Fowler was offloaded to Leeds, against his will, for a record-busting £11million. To say the Kop was shaken would be a gross understatement, with letters of protest flooding the local press. The anger subsided slightly when Fowler failed to set the world alight at Elland Road and later Manchester City - but the general consensus remained that he was suffering from a broken heart at being forced out of his beloved club. He remained a big Reds fan and even travelled to Istanbul to watch the 2005 Champions League final. Talk of a return occasionally popped up in the sports pages but was always shrugged off as pure fabrication. Until January 2006, that is, when Liverpool's prodigal son made a second coming. Rafa Benitez did his own stock no harm at all by securing the striker on a free transfer, and though Fowler was not the player he once was, the Kop still purred at occasional glimpses of his old magic. A year and a half later, after an up and down second spell, he bowed out when Charlton came to Anfield in the final league match of 2006-07. Now a free agent, the veteran frontman signed for Cardiff City, for whom he'd feature at Anfield in the following season's League Cup. The reception afforded by the Kop on this emotional return is testament to the high regard he'll always be held in these parts. God, but never forgotten. Leeds, Manchester City, Cardiff City, Blackburn, North Queensland Fury (AUS).